Open the front-loading door and treat clients to a soothing warm towel. Towels are at the peak temperature of 170 °F so they stay warm longer. Cabinet holds 24 facial towels and features a built-in sanitizer - a welcome time saver. Temperatures may vary. 110-120V, 60 Hz, 200W. Includes (24) basic, 12"x 12" washcloths FREE. This Hot Towel Cabinet with UV Sterilizer is designed to keep towels at a comfortable 170 degrees. That way, they will stay nice and warm for better customer comfort. The built-in UV sanitizer in the cabinet means you don't have to waste any time cleaning the towels yourself. Keep in mind that towel temperature may vary in the device with regular use. 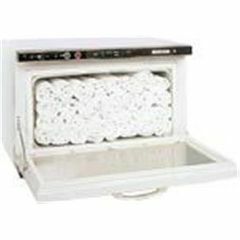 In addition to the warmer itself, you will also receive 24 free 12" x 12" washcloths for use in the Hot Towel Cabi warmer. This is a great way to keep sanitized towels warm and ready to provide excellent patient relaxation.